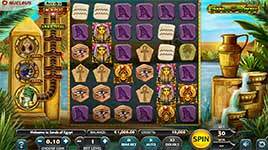 Journey to fertile lands and live among the Gods in Sands of Egypt online cluster pays slot by Nucleus Gaming. Indulge in the scenic visage of the ancient city as you collect symbols of the Gods advancing different trails in a revolutionary trail system. Work toward 3 different types of free spins, and a massive Jackpot that is as monumental as the treasures of Egypt themselves! Pyramid Wild Symbol – The Pyramid Wild substitutes for all symbols except the gods Ra, Anubis and Isis. A cluster of wilds will only substitute for adjacent symbols and will not be counted as symbols that are not contiguous to the group. Cluster Wins – All wins, except Ra symbols, are triggered by clusters for 4 or more contiguous symbols. Exploding Wins – All winning symbols explode with remaining symbols dropping down to fill the empty spaces. New symbols will drop in to fill newly created spaces above with new wins being calculated and the process repeating until no new wins occur. Double Up Game – Press the double up button after any standard win to gamble your winnings with the potential to double your initial win. Free Spins Bonus Rounds – All of the gods including Ra, Anubis and Isis have their own power bar and free spins bonus round. Land a cluster of four or more matching gods to advance the corresponding power bar and work toward earning a free spins bonus round!